James Reid may be one of the hottest matinee idols now, but along with that is being hounded with controversies. Controversial photos of OTW’s Clark circulate online showing him getting feely and touch with a girl identified as Debs Garcia. They have been spotted also at the Imperial Bar together. Debbie Garcia is a fellow Viva talent. She first became known in a reality project called Pantaxa. She posted for FHM magazine in 2014. She describes herself as sweet and smoldering. Her Twitter account is itsdebbiegarcia and her IG is debsgarcia. It is not confirmed if they are dating or are now officially an item, but netizens would like to believe so. 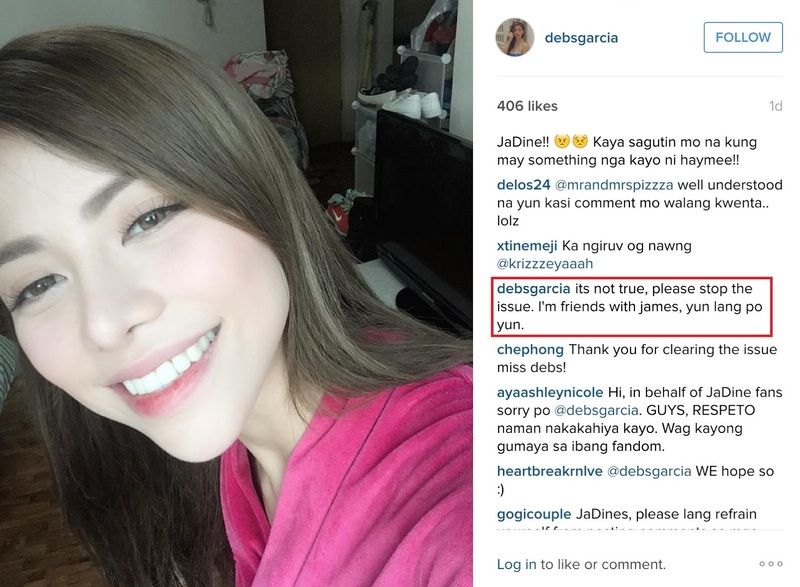 Updated : Debs commented on IG that she and James Reid are friends.